In a landmark meeting with leading donors, WHO has sought to strengthen partnerships and rally support for more “flexible” funding to fuel the Organization’s US$ 14.1 billion five-year plan of work aiming to improve the health of some 3 billion people worldwide. 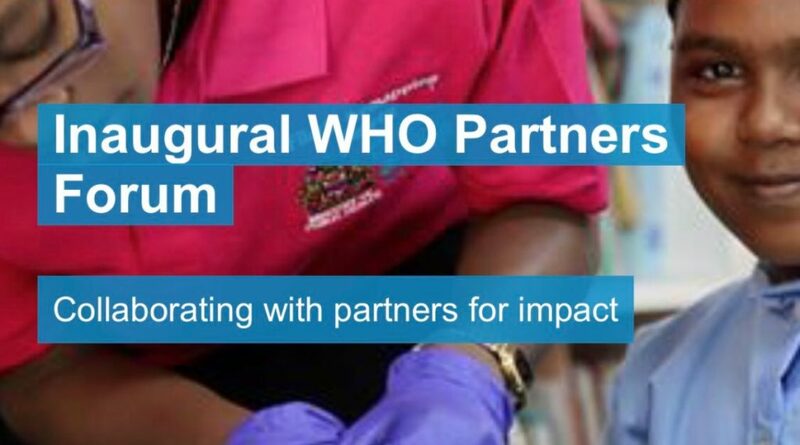 WHO’s Inaugural Partners Forum, which took place yesterday and today (9-10 April) in Stockholm, Sweden, provided a space for candid discussions of how WHO and partners can work together to close a US$ 10.1 billion funding gap that exists between the currently budgeted resources and the ambitious plans of WHO’s Thirteenth Global Program of Work 2019-2023 (GPW13). Discussions at the forum also called upon members states and partners to increase flexible funding to enable WHO to be more agile in budgeting across the organisation, when implementing its five-year plan towards achieving its “triple billion” targets. Sweden’s Minister for International Development Cooperation, Peter Eriksson, described the forum as a “historic moment for honest discussions on tackling modern global health threats,” according to a WHO press release. “If the world is to meet current and future health challenges, we need to ensure WHO is equipped and supported to be able to lead the global response,” he said. The forum, co-hosted by the government of Sweden, brought together over 200 participants, including representatives of WHO Member States, intergovernmental organisations and other key stakeholders including academic institutions, civil society organisations, philanthropic foundations and private sector entities. An outcome document from the forum will be made available that will highlight specific ideas and recommendations made by WHO and partners for efficient and effective financing, particularly financing that is flexible and predictable. WHO’s Thirteenth Global Program of Work 2019-2023 (GPW13) details WHO’s “triple billion” targets, which include: 1 billion more people benefitting from universal health coverage; 1 billion more people better protected from health emergencies; and 1 billion more people enjoying better health and well-being. “Our agenda is ambitious – it must be. Too much is at stake for us to aim low. Like everything good, it comes with a price attached: US$ 14.1 billion over the next five years,” Dr Tedros Adhanom Ghebreyesus (Dr Tedros), Director General of the WHO, said in the forward of WHO’s investment case for GPW13, which formed the basis of discussions at the forum. “Global health partners must accelerate efforts if we want to achieve the Sustainable Development Goal of providing health for all,” Peter Sands, Executive Director of The Global Fund to Fight AIDS, Tuberculosis and Malaria, said at the forum. “At the Global Fund, we are inspired by and committed to working with the WHO. To end the epidemics of HIV, TB and malaria, we need to work in close partnership with the WHO, making the most of their technical support to countries in need,” he said. The government of Sweden, which co-hosted the forum, is one of the top donors in development aid compared to its gross national income, and is the leader in providing fully flexible funding to the WHO. 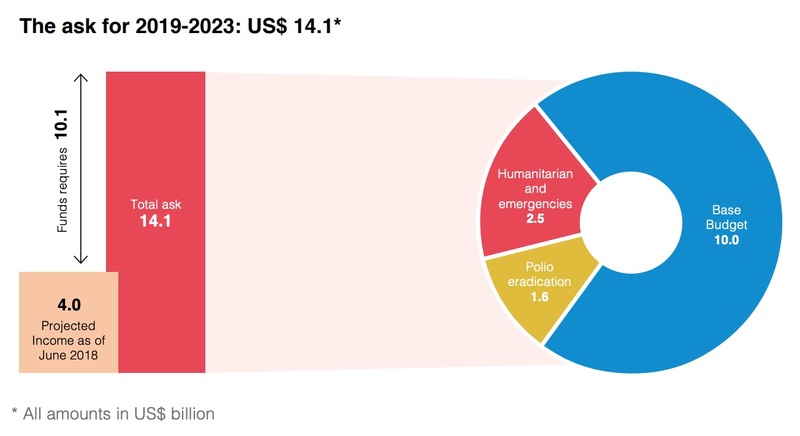 According to WHO’s Thirteenth Global Program of Work 2019-2023 (GPW13), the organisation will need to raise US$ 14.1 billion over the next five years to meet its “triple billion” targets. WHO’s investment case for the GPW13 estimates that its “projected income against the US$ 14.1 billion is US$ 4 billion, which includes income from annual dues and long-term pledges,” meaning that WHO has a projected funding gap of US$ 10.1 billion over the next 5 years. Raising the full US$ 14.1 billion “will help to save up to 30 million lives, add up to 100 million years of healthy living to the world’s population and add up to 4 per cent of economic growth in low and middle-income countries by 2023,” according to the investment case. This amount is not too much larger than what WHO would normally raise in a five-year period, as WHO generally raises about US$ 2 billion annually, the WHO official explained. However, it does represent a 14 percent increase of the base budget of the WHO, as compared to the approved programme budget for 2018-2019, the investment case highlighted. “In addition to the US$ 14.1 billion needed to ensure successful implementation of GPW13, appropriate levels of flexible, aligned and predictable funding will be critical,” the forum event page noted. GPW13 emphasised that “the quality of funds is almost as important as their quantity,” while at the WHO Executive Board meeting in January of this year, Dr Tedros called for quality, un-earmarked funds (Health Policy Watch, WHO Executive Board, 24 January 2019). “You don’t have big scaled change if you have small projects everywhere,” he said. One of the factors that can complicate WHO’s job has been an increase in earmarked contributions over the past decade, and a corresponding decrease in the proportion of flexible funds, the investment case explained. “Although such [earmarked] funding is welcome and important in tackling specific diseases, too great a dependency on such funding seriously constrains the organization’s ability to apply funding according to evidence of need or respond quickly to changing conditions,” it said. “As organizations change – and as you know the new [WHO] strategic plan is underpinned by a pretty far-reaching transformation process – you need to be able to move resources, and if those resources are very tightly earmarked, we can’t move them, and that could hamper the transformation process,” the WHO official said. WHO’s programme budget is financed through a combination of flexible and earmarked funding, with earmarked funding making up about three quarters of the 2018-2019 budget. Flexible funding, correspondingly, made up approximately one quarter of the budget. It is composed of assessed contributions, which are annual dues member states pay to the WHO, calculated relative to the country’s wealth and population, and by core voluntary contributions. Assessed contributions “have declined as an overall percentage of the Programme Budget and have, for several years, accounted for less than one quarter of the Organization’s financing,” the forum event page noted. Core voluntary contributions also made up only five percent of the total voluntary contributions in the budget. The top contributors of these flexible voluntary contributions for the 2018-2019 budget were led by Sweden, the United Kingdom, Australia and Norway. The top contributors of earmarked specified voluntary contributions for the 2018-2019 budget were led by the Bill & Melinda Gates Foundation; the United States of America; the United Kingdom of Great Britain and Northern Ireland; the GAVI Alliance; and the European Commission. Image Credits: PAHO/WHO/S. Mey-Schmidt, WHO.